My control plate has had problems staying on. The hole for the rear screw is stripped, and has fallen out. Don't worry, don't worry. I know the fix. A toothpick and some wood glue add material to the hole, giving the screw something to grab onto. But I've fixed a hole and had it strip out on me again, so I'm more and more considering my options. First one is to start fresh. Get a new body from Warmoth or somewhere. Black hides a multitude of sins, and mine has experienced enough that the black is flaking off in places. Yeah, I know that folks pay extra to buy a beaten-up guitar, more power to 'em, but part of me wants a pretty black guitar again. And if I go this way, I can go ahead and get something routed for a neck humbucker or 2 Strat pickups or something. The downside here is that I'd be looking at $300 or more when I'd rather hold onto that much money for a while, if I actually had it sitting around. The second is threaded inserts for where the control plate connects to the body. Then it would be just metal screws to connect the plate to the body. Hardware and superglue to hold it in place and I should have a control plate I can be in and out of all day, for under $20. I think I'll try that first. I also think that, when I get to where I can start making my own dang guitars, I'll do that for mine. I know of folks who put inserts on the neck so they can get it on and off quickly over and over without stripping. I so like. Honestly, I hadn't heard of him until I saw notice of his passing, and upon hitting play on this Youtube vid, I felt immediately sorry for his passing but joyful at discovering his playing. This is why I love Premier Guitar! 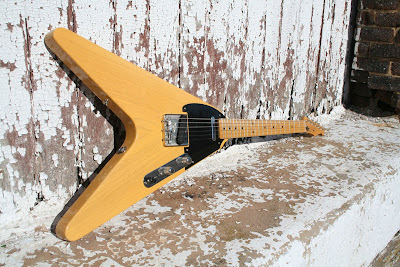 As is clear, it is a guitar with Telecaster stylings on a guitar with a Flying V body style. It's called the Tee Vee and it's from RS Guitar Works. This one draws from the original blackguard look of 1950s Teles, while the one Premier Guitar reviewed is more drawn from a 1960s Custom Tele, sunburst with a rosewood fretboard. On TDPRI, the great guitar sparkler Buckocaster once put holographic sparkle on a Tele-V body, but I don't think I ever saw the completed guitar, so this is not quite as original as it seems, but it's a great and wonderful thing. St. Louis and Sammy Hagar go together like Philly and cheesesteak, and since I lived there, I've had a soft spot for the Red Rocker. This footage was played on MTV in the time before Thriller, and IIRC it was filmed in St. Louis at the arena where the St. Louis Blues played hockey. I point in the part starting at about 5:30 where Sammy plays lap steel. Of course, he's getting that accelerating car sound, who would expect anything else from him? He's on top of a red Pontiac Firebird when he's playing it! The coolest part is the way he throws it. I think that might be the only lap steel ever hooked up to a wireless system.